Dremora Sovereign is a Dremora warrior whom you must summon during the quest The Arms of Chaos as part of the Arms of Chaos Creation. Once you have obtained the Sovereign Band, you will be directed to use it at a Daedric altar east of Skytemple Ruins in order to summon three Guardians of the Sigil Stones. Activating the altar will summon three Daedra in short succession: Dremora Sehtkynaz, Dremora Lyrkynaz, and Dremora Sovereign. Dremora Sovereign is the third Dremora to appear, and will be summoned as soon as you kill Dremora Lyrkynaz. 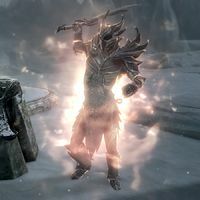 Dremora Sovereign utilizes powerful fire magic in combat and can summon a flame atronach. He carries a Daedric Sword of the Inferno along with an Orange Sigil Stone. He will drop a Deadra Heart when killed. This page was last modified on 26 March 2019, at 23:33.